Tweet translation: Agent 404 has done it again. For successfully completing today's assignment, he has been granted a short-term vacation (vato-News) - Peacemaker center, 16 April 2015. The website enjoys the support of at least one high-profile Ukrainian official: Anton Gerashchenko, an adviser to the interior minister and a member of the Ukrainian parliament. In one of his Facebook posts, he advised people to post updates to the website. Praising the work of the website for helping him shoulder the heavy load of information on “terrorists” and “separatists,” Gerashchenko attacks the view that sharing extensive personal information is a breach of privacy. “Not at all!” he says, citing Article 17 of the Ukrainian Constitution, which states, according to him, that “the defense of national sovereignty and territorial integrity of Ukraine, ensuring its economic and information security is one of the external functions of the state, and is the business of all the people of Ukraine... Everyone who reports a name to the website, or another [resource] is doing the right thing,” Gerashchenko writes. Below is a video ofUkrainian Interior Minister ArsenAvakov physically assaulting Kalashnikov during a TV show. 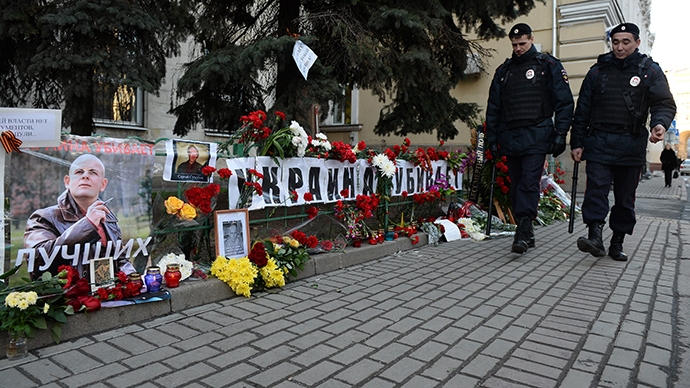 The radical Ukraine Insurgent Army (UPA) organization claimed responsibility for Kalashnikov's and Buzina's murder. The statement was made in a letter to Ukrainian political analyst Vladimir Fesenko, who says he received it. Ukraine's national security service SBU has said that the letter was sent from a German-hosted service, with the help of an anonymizer, such as Tor. After conducting a linguistic examination of the text, the agency claimed that the author appears to be a non-native Ukrainian speaker, peppering the missives with words borrowed from Russian. This week alone has seen at least four killings of opposition figures in Ukraine. It all started on April 13 with the slaying of journalist Sergey Sukhobok – followed by Kalashnikov two days later and Buzina, the day after that – on the 16th. The latest murder happened last night when another journalist Olga Moroz - the editor-in-chief of the Neteshinskiy Vestnik, a Ukrainian paper - was found dead in her home, RBK Ukraine reported. Her body showed signs of a violent death. Some possessions were missing from the apartment, according to police. Although her work is listed among the causes investigated, the police say there are no allegations relating to any complaints of pressure or threats of violence reported by the journalist. Buzina’s murder has led to strong condemnation from the OSCE’s Representative on Freedom of the Media Dunja Mijatovic. The official also commented on the murder of Sukhobok, who was co-founder of a number of online news portals and contributor to several more Ukrainian media outlets. An investigation is underway. On Friday, UN General Secretary Ban Ki Moon released a statement expressing "serious concern" about the spate of murders in Ukraine, demanding a thorough investigation that will restore "the primacy of law." Mijatovic's and Ban's comments are the latest in a long string of international condemnation of the alarming rise of media murders. "We continue to condemn and call for an end to attacks on journalists notably in eastern Ukraine, including killings and abductions," the statement read.